It's Monday morning - already, again. I have knitting progress and so much more to share, but there was not one spare moment this weekend to take any pictures. That's the way it goes sometimes. I'm immersed in a behind-the-scenes website update. What started out as a small project has suddenly taken on a life of its own. I promise a full report with pictures in my next post. 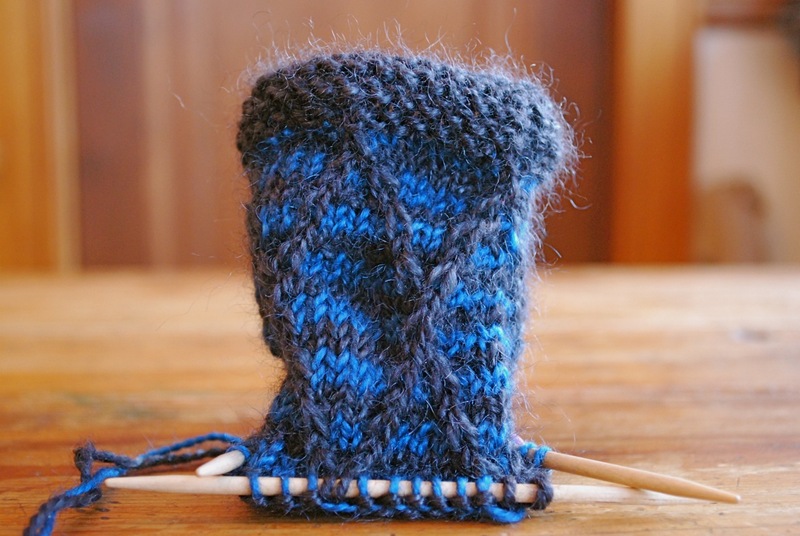 Today I leave you with a story of handknit socks that were destined for fame in Hollywood. These socks were commissioned for the movie True Grit. While I find these quirky, authentic details interesting, now I wonder what yarn they used and if the socks have heel flaps or short rows. I have a new project underway. The yarn was with me on a recent shoveling expedition. My reward for shoveling was some knitting time. With very little time invested I had this much to show for my efforts. This is a scarf. I'll give more details in another post. Let me just tell you that I'm in love with this yarn and am already plotting another project with it. 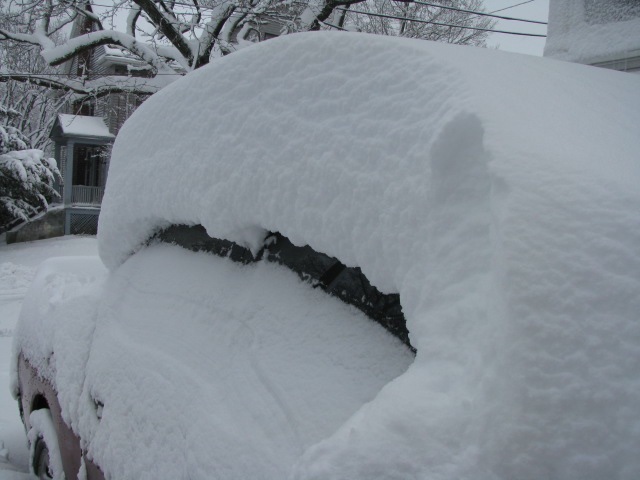 The snow continues to pile up around here, and several roofs have collapsed under all the weight. 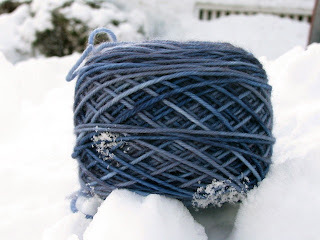 As I shoveled yesterday I thought of the snow as a metaphor for my dyeing work. Several things have come together in the last couple of days, and I suddenly find myself buried. It's all very good and exciting, but I need to dig myself out. The pile at the end of the driveway is now taller than I am. 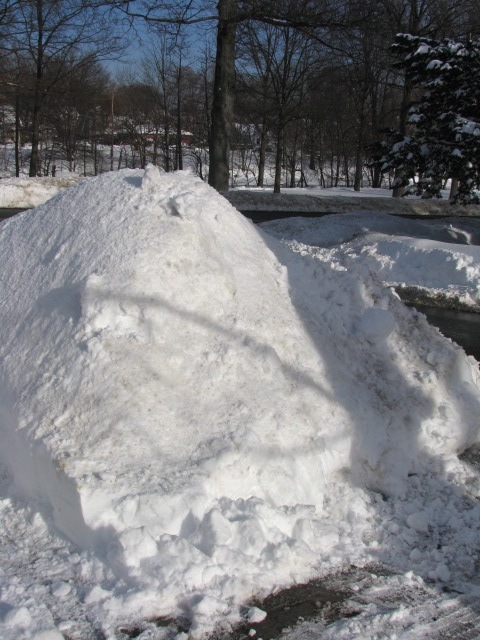 I'm on the short side so that probably isn't saying much, but this pile is well over five feet tall. Then I found this pile. A massive mountain of snow. It gives me hope that I can dig out from under all my work. It's the dead of winter. I embrace the gray days that signal an approaching storm, but I also appreciate the clear sky that comes after the storm. My color inspiration for the week comes from the latter. 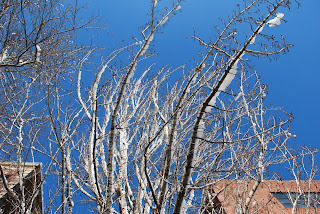 Glistening, icy, snow encrusted branches against a clear blue sky. I've been following a story and watching a groundswell of community support, generosity and activism. Earlier this month the barn on a Vermont farm burned to the ground. The farm, Pete's Greens, is an organic farm that offers a CSA (community supported agriculture). Given my involvement with food co-ops and CSAs that alone was enough for me to take note of the situation in Vermont. The farm was underinsured and lost equipment, crops and a tractor trailer freezer full of meat. You can read more about the fire here. Enter Susan and Juniper Moon Farm. In an effort to spread the word Susan wrote a blog post about Pete's Greens and the fire. But that wasn't all. Susan also set up a fund to accept donations to help rebuild the barn. And she didn't stop there. She is also holding a giveaway for people who make donations or who spread the word about the fundraiser. Scroll down to the bottom of the blog post to see the list of prizes. It's pretty impressive. I've seen the knitting community do this before, and I'm sure I'll see it happen again. 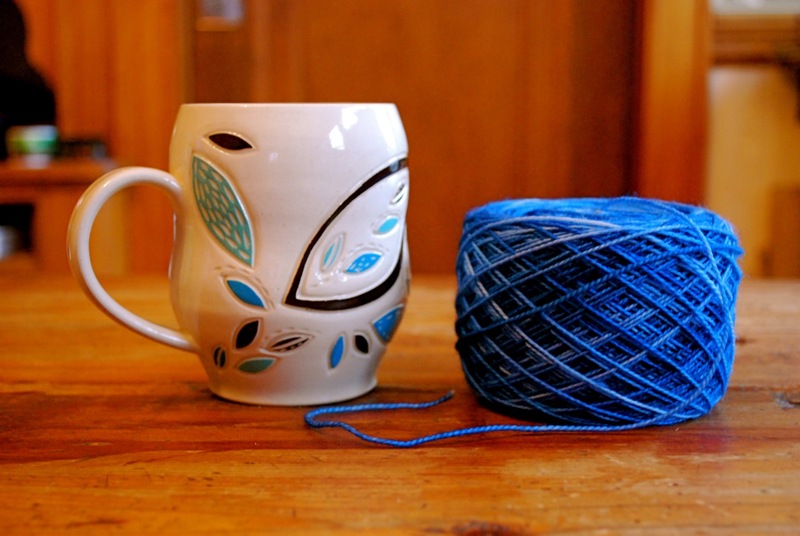 Knitters can be counted on to unite, rise to the occasion, reach out and help someone in need. It is truly inspiring. Go over to Susan's blog and read about the fire, the fundraiser and the giveaway. Spread the word. Make a donation if you can. Now I'm off to tend the dye pots. I'm trying to squeeze the most out of each and every minute of each and every day. There's nothing like preparation for an event to make me use my time efficiently. This past weekend was devoted to planning and production. Planning included finalizing the last of the new booth samples, finishing paperwork for upcoming events and working on a website update. Production involved dyeing - new yarn line, new colors. 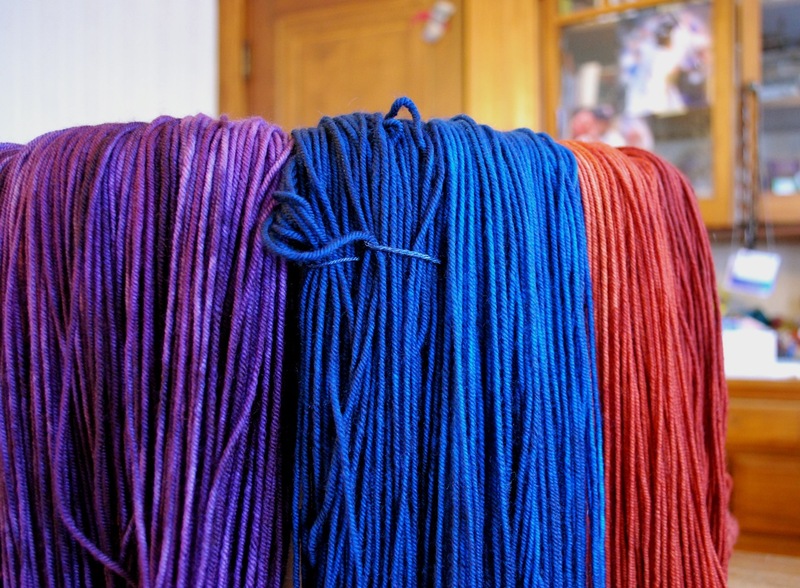 These skeins and many more were twisted in preparation for photos and labels. All this planning and production didn't leave much time for knitting. In the little bit of time I had I finished this hat. 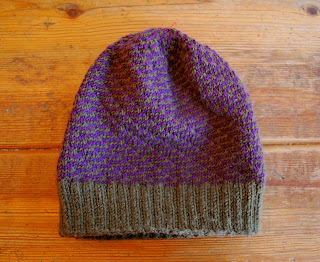 The pattern is Marram Hat, the yarn is two unidentified balls from stash. This photo doesn't do it justice - be sure to click on the link. This quick, fun design uses two colors and slipped stitches to create a textured spiral fabric. The only modification I made was to knit a deeper brim. Warm and cozy. 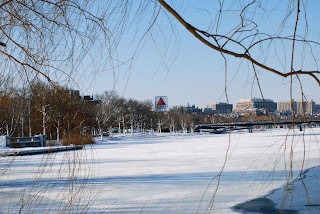 Today I leave you with a couple of shots taken during a walk along the Charles River. And one of my favorite sculptures dusted with snow. 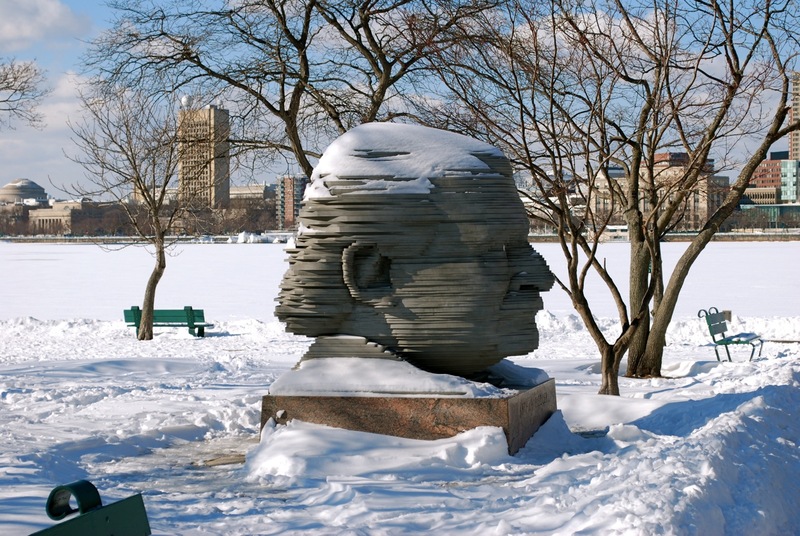 Arthur Fiedler. You can read about this work of art here. I had a goal to share my latest finished object with you this week. I finished this mitt a few days ago and finally took some photos. This is another booth sample. 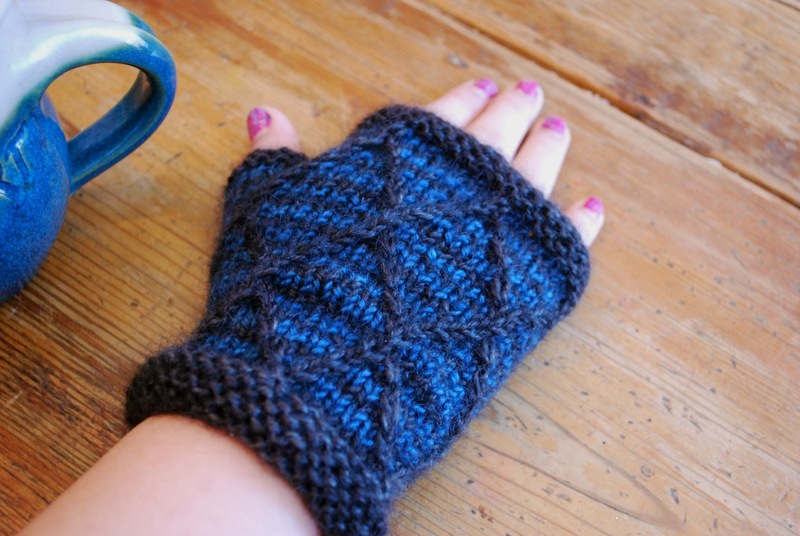 The pattern is Diamondback Mitts by Stephen West. 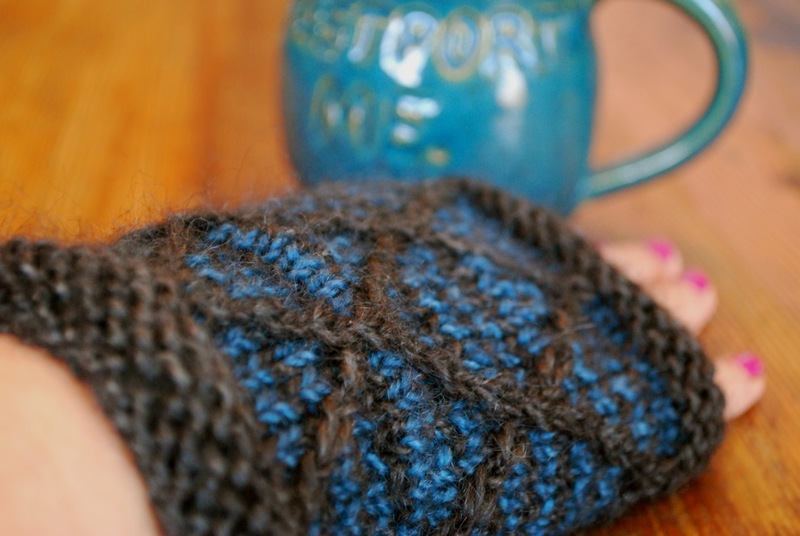 The design is on both sides of the mitt and is created using slipped stitches and cables. It's a great project for someone who wants practice with these techniques. I was delighted with the thumb. 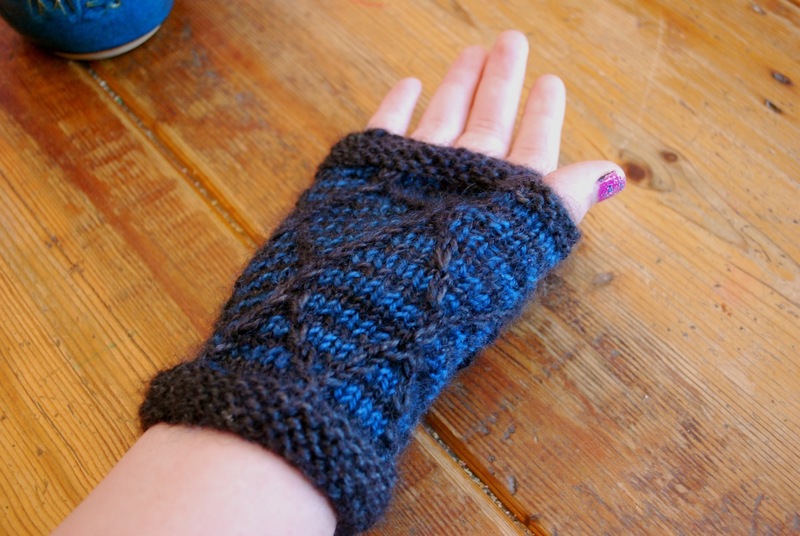 The cabled stitches form a perfect thumb gusset. The pattern is written for two color stripes. I think it would also look nice in one color, so I may knit a solid sample also. 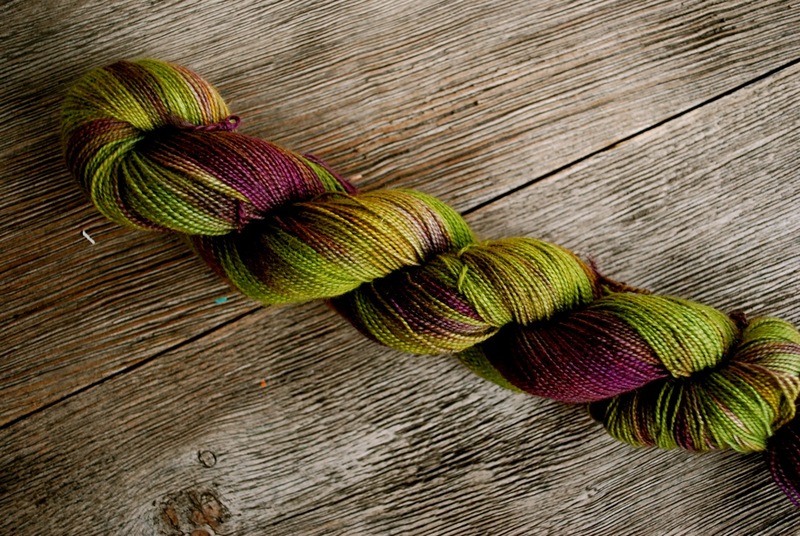 I really enjoyed working with this worsted weight yarn. For now I am only dyeing it in a variety of colors for this pattern, but I may add it to inventory down the road. This bowl of goodies caught my eye recently. The earthy tones of tan to brown to dark brown are so warm and inviting. They are my color inspiration for the week. I planned to have knitting pictures to share with you today but ran into some lighting issues. I'll try to pull those together for later in the week. Never fear. I do have several fun tidbits to share with you in another installment of . .
~ If you need to create a color knitting chart, check out the chart maker at Tricksy Knitter. Once you start playing around with it, you'll come up with all sorts of ideas. A very handy tool. ~ Yarn Monster is a yarn winder with character. This extraordinary winder even comes with a remote control. 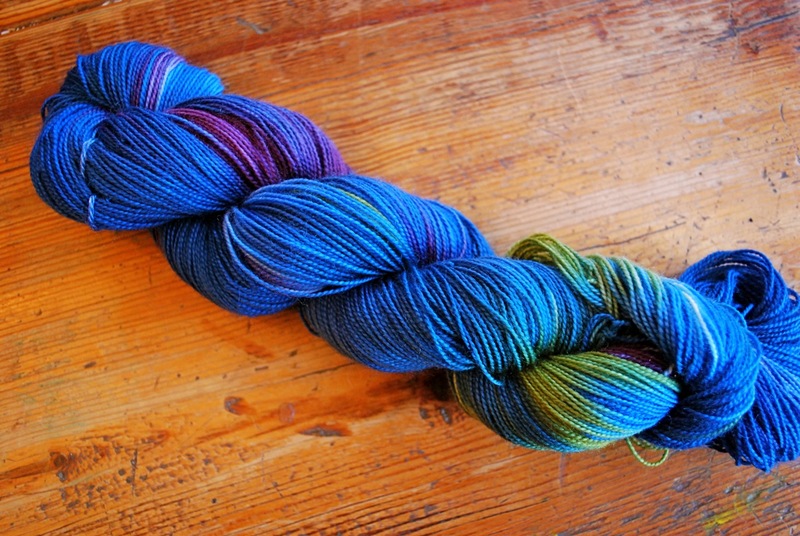 Be sure to read the story of how Yarn Monster came to be. ~ Take Knitting Daily with you when you're out and about using a new app for iPhone and iPod touch. This could come in handy when you have a knitting emergency on the road. And it's free. ~ Finally, click on over to the Silk website for fun with movement and color. Follow the instructions and give it a whirl. And now I'm off to do another round of planning - more dyeing, more booth samples. This past weekend was filled with a variety of activities. Friday night found me at the Common Cod Fiber Guild meeting. The program for the evening was Ignite Craft: Boston. 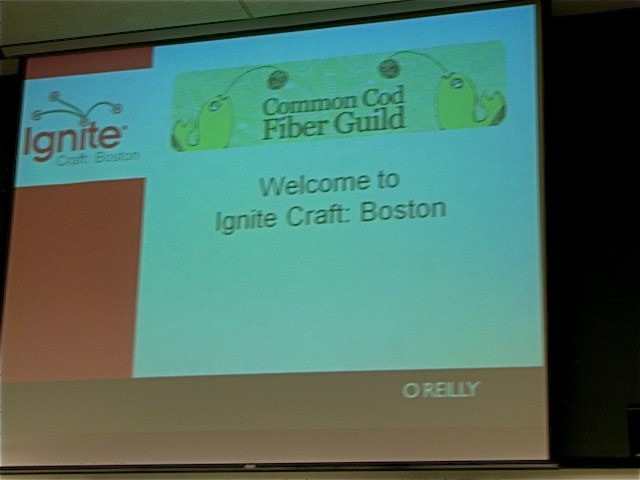 The format was based on this Ignite model. Using slides the presenters were given five minutes to talk about their passions. There was no starting over, no time for questions and answers. Once a presenter started, he/she had to keep going. We heard presentations about everything from a modern letterpress studio to how to drink a craft beer to locks and how they work. And there were presentations about fiber crafts - how a knitting charity was started, self publishing a knitting book, marketing for crafters and social media. The presenters were clever, witty, informative and entertaining. It was a fun evening. The result of my weekend knitting was more negative progress than forward progress. Negative progress - the hat I thought I had completed one night had to be ripped out the following morning. I probably could have lived with it, but I had envisioned a hat that came down over my ears. This one didn't. I'm proud of myself for coming to this conclusion before I had closed off the top. I ripped it back to the brim and will knit it all over again. I'm consoling myself with the notion that it will knit up quicker the second time around. Forward progress - I'm testing an idea for the booth, testing new colors and new yarn. 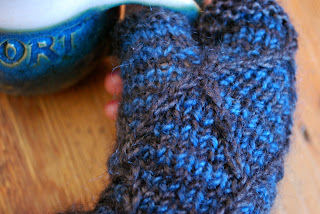 I started this - a new fingerless mitt. I think it's a keeper but will decide for sure once it's finished. The nice thing about this mitt is it's so small it almost qualifies as a gauge swatch. 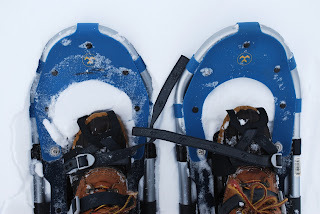 And there was time for fun in the snow. 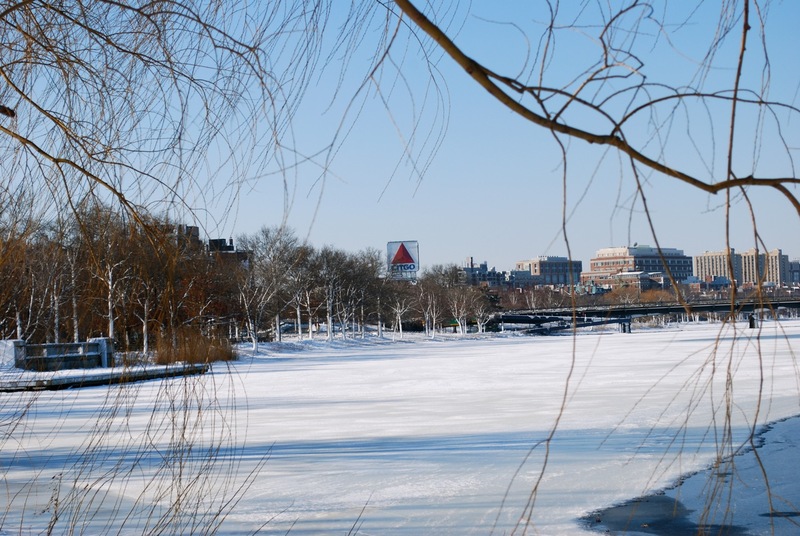 A walk along the Charles River. 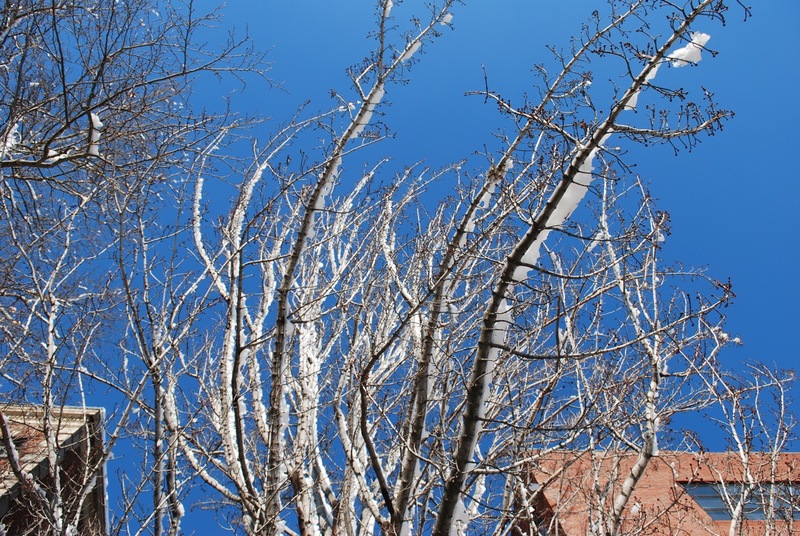 We don't often see such a clear, cloudless, blue sky. 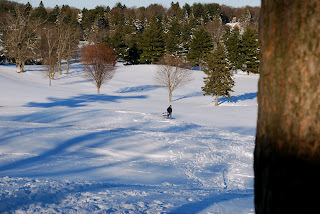 More sledding . . .
. . . and snowshoeing. I wonder if these were ever found. Lost and in a tree. I finished Milkweed Shawl the other night. As my family will attest to I have a habit of putting aside things that need to be blocked. Slowly a mound grows and then I go on a blocking binge. This time rather than put Milkweed aside "to be blocked later", I got right on it the next day. 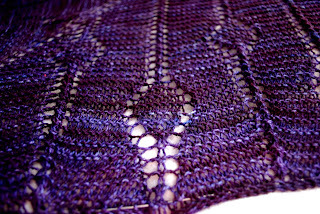 Before long the shawl was bathed and on the wires. Milkweed has a simple yet elegant motif against a background of garter stitch. The pattern is easy to memorize and includes both chart and written row instructions. 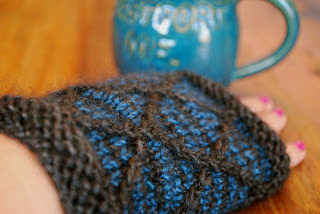 There is an element of texture created by lines of centered double decreases - a nice complement to the garter stitch. 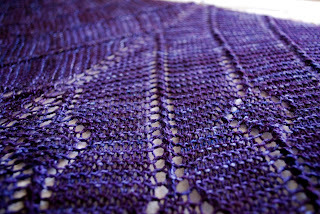 The yarn is Dirty Water DyeWorks Lillian, colorway Purple Potion. 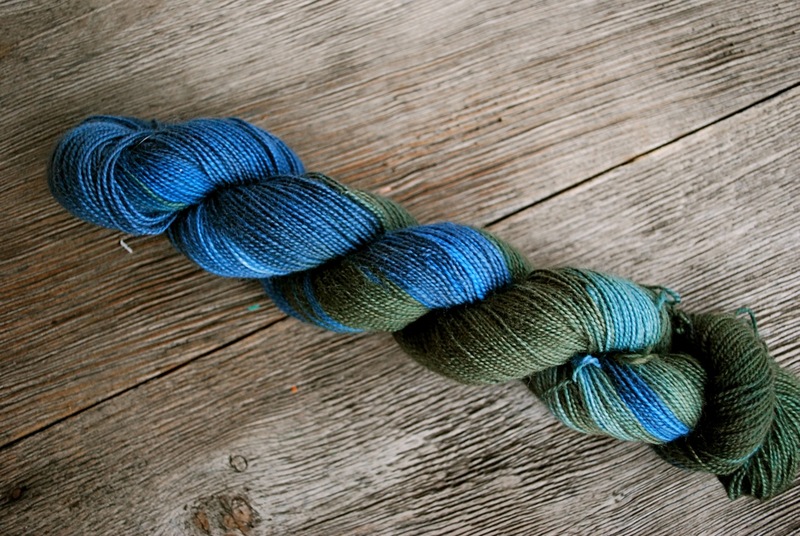 Lillian is 100% Superwash Merino with a firm twist and good stitch definition. It dyes up nicely in rich, vibrant colorways. 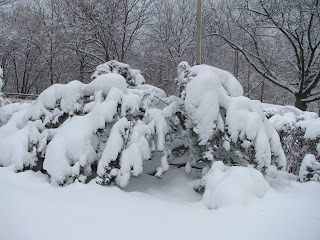 The nor'easter this week dumped over 20 inches of new snow. The storm started with wet, heavy snow that put a load on many trees causing power outages throughout the area. Wind that created swirls and patterns, sculpting the snow as if it were clay. 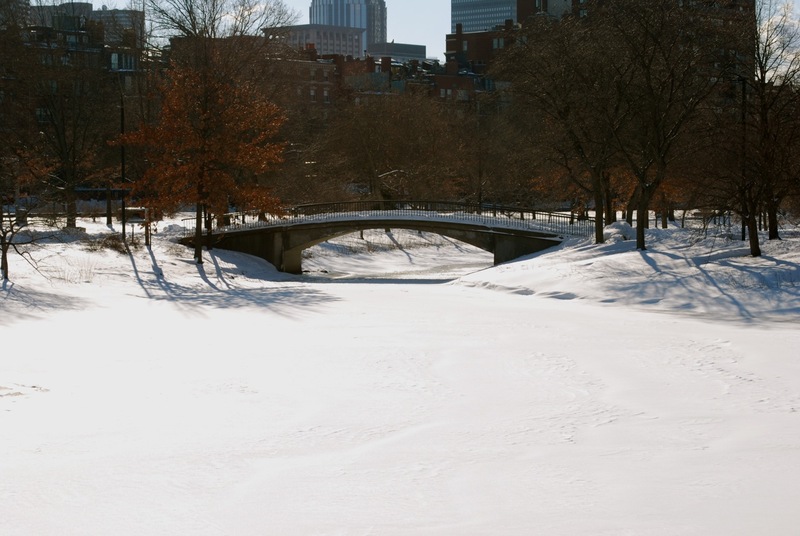 The day after the storm dawned clear and cold. A perfect day for sledding. 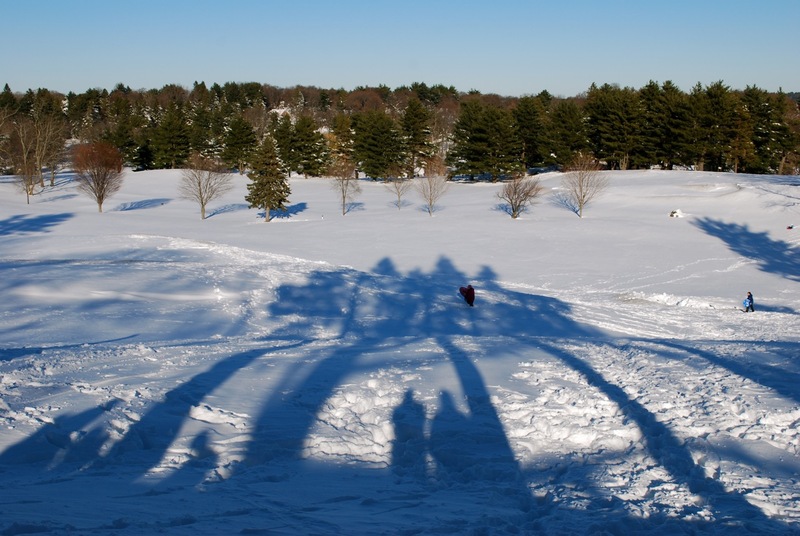 My color inspiration for the week comes from the top of the hill as afternoon shadows stretched across the dazzling snow. 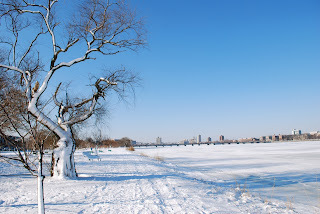 The contrast of deep blue on a white canvas. 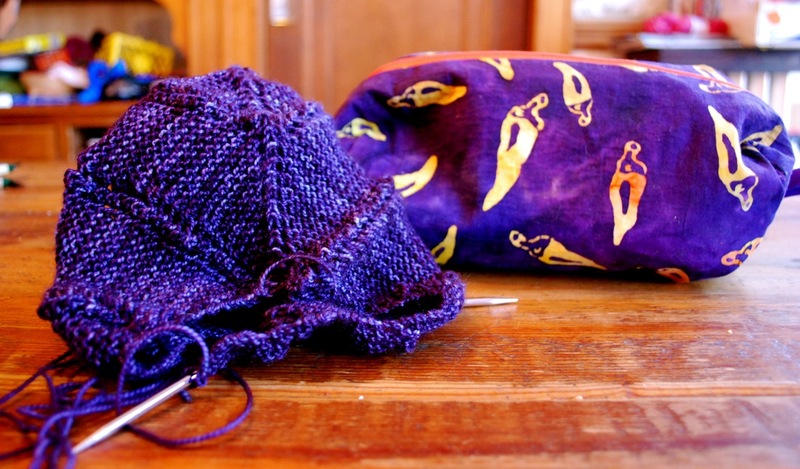 These days I'm caught in a whirlwind of sample knitting. It really adds to the booth if I have sample garments on display, so I'm making a concerted effort to knit more of them. The trick to all of this is to stay one step ahead of the game. While I'm knitting away on one sample, I need to be thinking ahead to the next sample. I keep a running list of samples I would like to see in the booth. Before I finish one sample, l choose which sample will be next. Then I decide which yarn and color. Sometimes I don't have the color ready and waiting, so first I have to dye the yarn for the sample. That's the case with my next sample. I'm using a new yarn base so the other day I took time to dye sample colors. I'll start playing around with these as soon as I finish my current sample project. Speaking of my current sample I've made great progress on Milkweed Shawl. I'm working on the last chart with less than ten rows to go. I promise pictures with my next post. 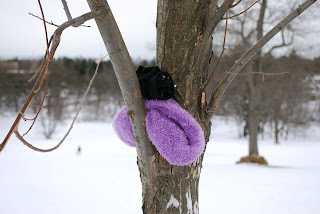 If you knit mittens, you might want to consider Northman Mittens. These lined mitts look oh, so warm and cozy. Proceeds from the sale of this pattern go to flood relief efforts in Queensland. We're in the midst of a snowstorm complete with power outages across the area. 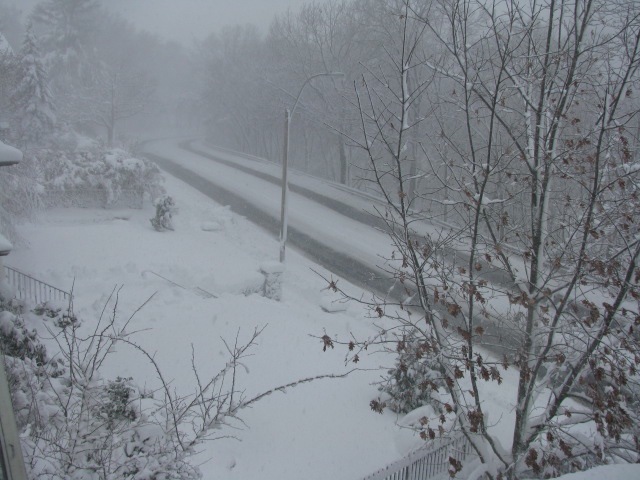 While I hate to lose power, it can be a mixed blessing. Without power I may be forced to spend the day knitting. 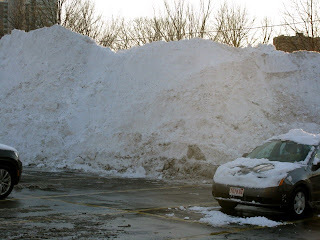 In the meantime I probably should think of shoveling snow. 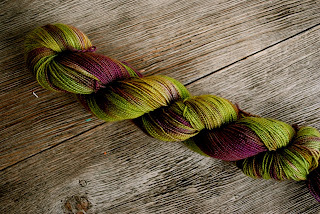 The last few days have been very productive dyeing days. I think the dyeing goddess was looking out for me. I'm afraid to count the days until my next event, but I know it's coming at me like a runaway train. I'll take any help I can get. 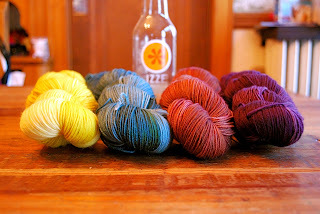 Part of my dyeing time was spent on multicolored skeins. These colorways, dyed in lots of two, are all one of a kind. Since I don't intend to repeat these specific colorways, I kept very sketchy notes when dyeing them - something I never do. I've learned the hard way that if I want to reproduce a colorway, I need to keep detailed notes. Instead this project was a good exercise to test new color combinations, and I'm sure that I'll do it again. It was fun to play around and not worry about the details. I felt like a kid with a new box of crayons. I also spent time dyeing up new colors for Lucia. These will be unveiled as soon as I have pictures taken. 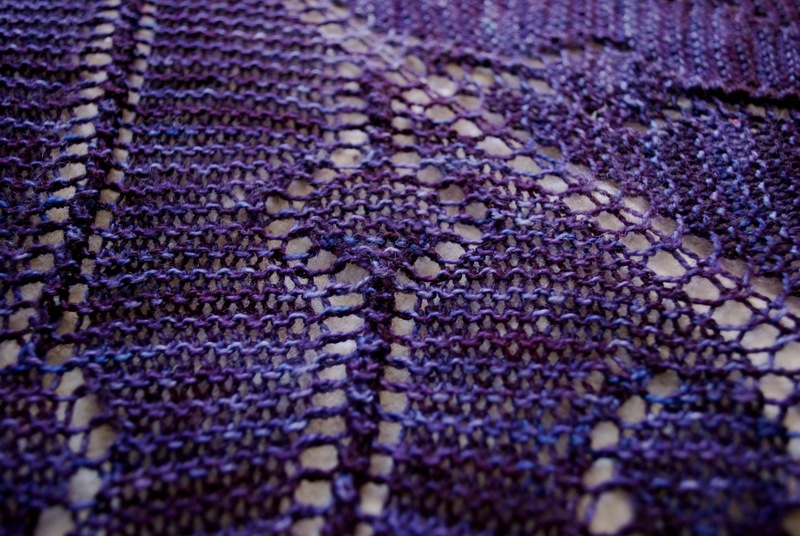 I've made progress on Milkweed Shawl although it's hard to see. I keep ticking off the rows, but somehow it doesn't seem to be much bigger. I'm in that black hole phase where no matter how much knitting I do, it doesn't seem to make much difference. But I have faith I'll get to the other side. I'm beginning to see a glimmer of light at the end of the tunnel. 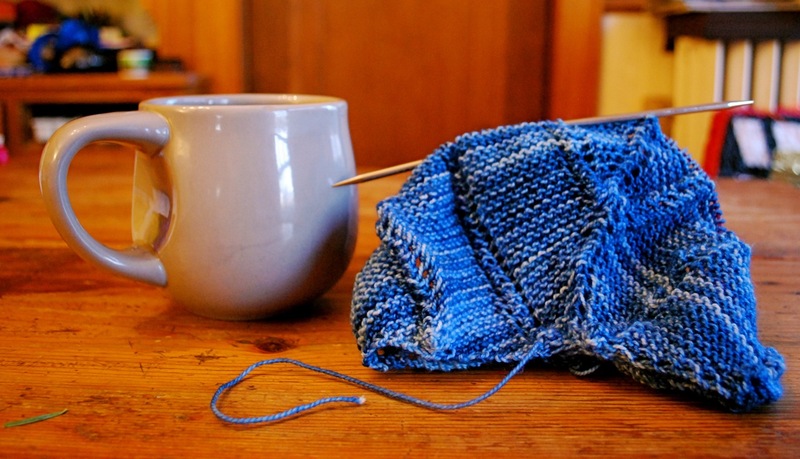 I leave you this Monday morning with a story of community knitting in action. The town of Cardigan, Wales decided to knit a cardigan to celebrate the town's 900th anniversary. The finished product is truly amazing and definitely one of a kind. You can read all about it here. Today is St. Distaff's Day, the first day following the twelve days of Christmas signaling a return to the normal work routine for women. The origins of this day date to pre-industrial Europe at a time when there wasn't factory-made cloth or commercially spun yarn. Everything had to be spun by hand, and women were always spinning to meet the needs of their households. Can you imagine? It sounds like more than a full time job. The distaff is one of the tools used for spinning. In an attempt to soften the blow of returning to work the day was jokingly referred to as St. Distaff's Day. There wasn't a real saint named Distaff. It's interesting, but not surprising, that men did not have to return to work until several days later on Plough Monday. You can read more about it here. 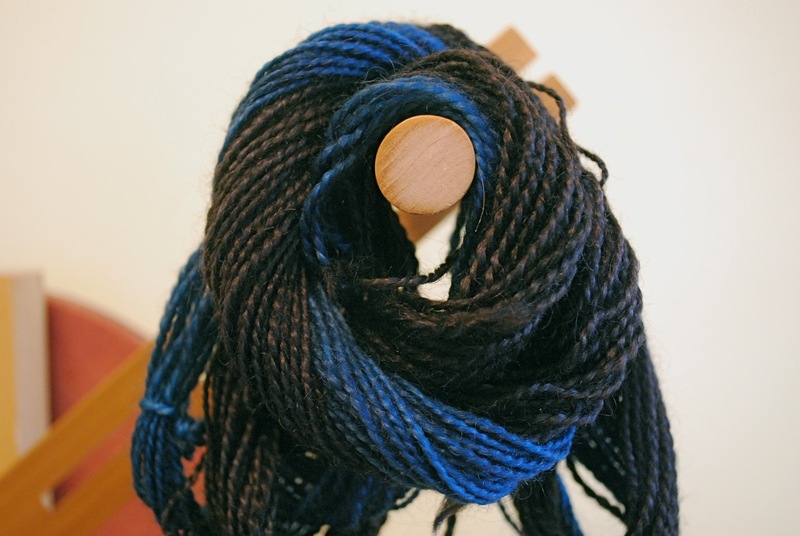 Some present day spinning groups and fiber guilds hold events to mark St. Distaff's Day. I've had a change of heart with my most recent booth sample knitting. Make that a change of color. Last you saw I was cruising along with the blue - which, by the way, is Lillian Cerulean. 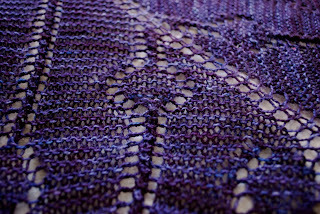 I love this color but for some reason wasn't loving it in this pattern. 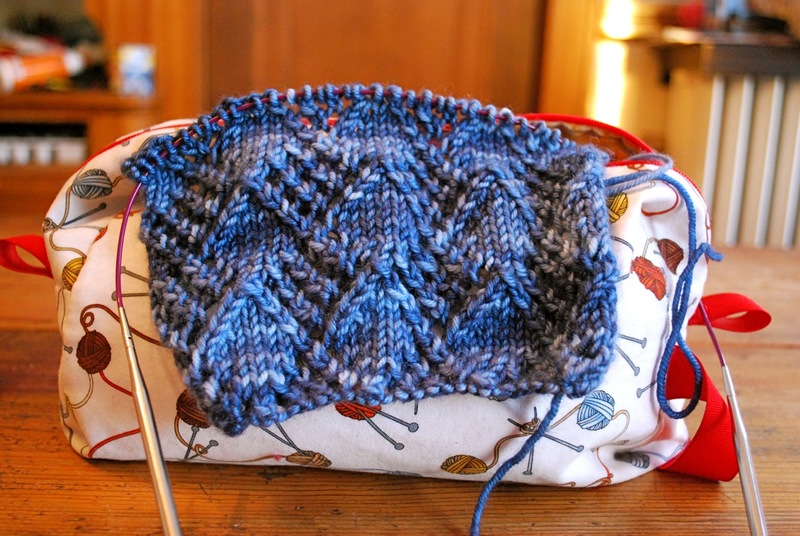 I had an inkling of this at about row 20 but kept right on going, thinking that if I knit just a little bit more the color would be what I had envisioned for this pattern. It wasn't. 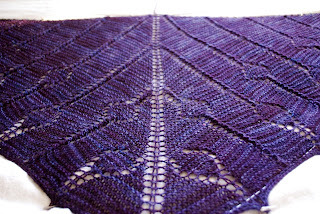 Somewhere after row 50 I admitted that I had pictured this pattern in a darker color. I did what any self-respecting knitter would do and started over with a different color. I'm now just past the point where I had stopped with the Cerulean. This yarn is Lillian Purple Potion. 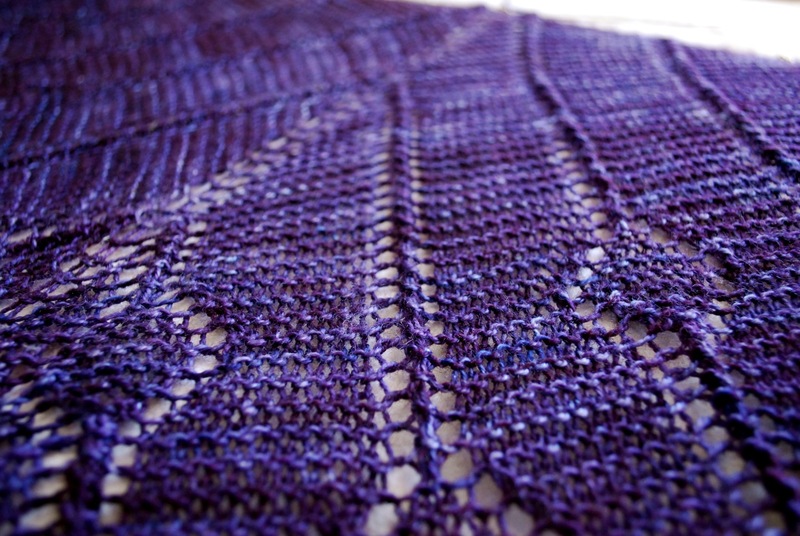 The pattern, even though you can't see much of it yet, is Milkweed Shawl. Having now worked well over 100 rows of this pattern I can say that I'm in sync with the rhythm of this design. It's mostly garter stitch with a little yarn over and decrease combination for texture. I'm on a roll. 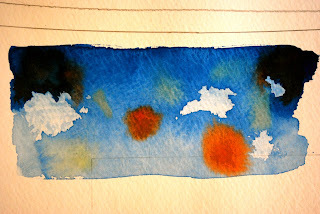 My color inspiration for the week is part of a watercolor collage and reminds me of the Cerulean I was knitting with. I've come to appreciate watercolors more and more over the years. Colors in motion, shifting and blending. We live in a day and age where people often have crazy busy schedules. And we add more to our schedules - juggle this here, run a little faster there. But the hours of a day are finite. Some days it's not possible to add one more thing to the daily to-do list. In the last 24 hours I've had two friends say no to longstanding commitments. One friend hosts a weekly gathering in her home and needs to take a break. Life has become overwhelming and something has to give. 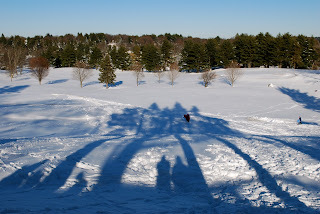 Another friend has given up writing her blog to pursue other forms of writing and to spend time with her grandchildren. There isn't enough time to do it all. While I will miss attending the weekly get-together and reading the blog, I admire these two women for saying no. I will remember them when the day comes and I have to say no to one more meeting, one more event, one more carpool. On the needles . . . I've started one of several new booth samples. Another shawlette. I'm enjoying the soothing rhythm of the mostly garter rows. I'm still at the point where the rows are zipping along, but that will shift with a few more increase rows. More pictures and details to follow. For knitters on the road . . . If you're traveling and find yourself faced with a knitting emergency, turn to Where's My Yarn for help. You can search for yarn stores by state, keyword or address. Very handy. It's Monday morning, and the holidays are officially over. After all the planning, preparation and anticipation it's always a bit of a let down. That's why it's a good thing to have lots of work lined up. There's nothing like a full schedule to get you back in the swing of things. In preparation for the week ahead I did some work over the weekend. 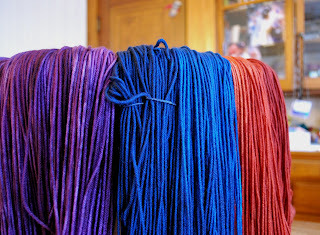 I will be dyeing later this week, so I spent time getting yarn ready for the pots. After a short break from dyeing over the holidays I'm back in the groove. I also posted all of the Dirty Water DyeWorks yarn on Ravelry. If you're interested, you can find it here. Another thing off my to-do list. Somehow I didn't get as much knitting done as I had anticipated - probably because I was working on all of the above. I do have something ready and waiting for me. This will be a new project, a new booth sample. By the way the mug is the work of Jennie the Potter. Check out her Etsy shop - she also makes knitting related pottery. Have you ever seriously considered becoming a shepherd? Do you have the space for a flock? 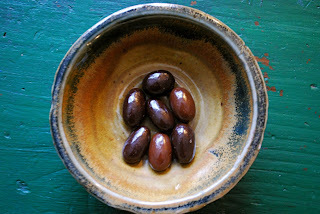 Susan from Juniper Moon Farm is having a Flock Giveaway. Actually she's giving away two flocks. Be sure to pop over and take a look. Even if you're not interested in entering, it's fascinating to follow the process and see who wins the flocks. 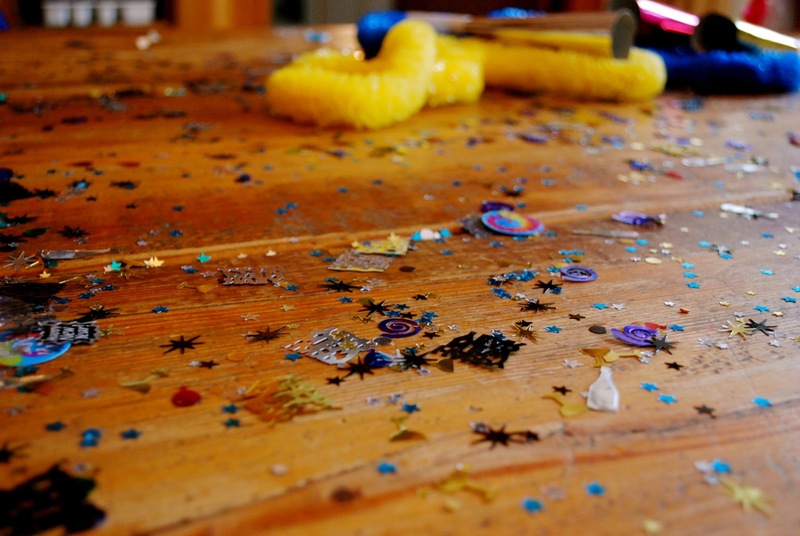 We had a bit of a celebration on New Year's Eve complete with hats, horns and confetti. 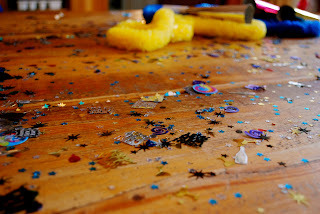 I woke up on New Year's Day to find this - remnants from the night before.